Are you a baklava fan? Unless you really dislike honey or nuts, there isn’t much in the flavor profile of the flaky, Middle-eastern pastry to object to. That being said, it is surprisingly difficult to find a good baklava. Far too many are too soggy, too mushy, too nuttyÂ or too sweet. As an alternative, I recently tried out this recipe for a Baklava loaf, which incorporates the nut and honey flavors of baklava into an easy-to-make quick bread. Instead of using phyllo dough, this loaf has a crumbly dough with a texture somewhere between scone and cake as its base. It also has a much higher bread/pastry-to-nut ratio than a typical baklava. The dough is rolled out into a flat rectangle and spread with a nut and cinnamon mixture, then rolled before baking. The whole process takes only a few minutes from start to finish and both the dough and the nut filling can be prepared in the food processor. The result is delicious. The honey and nut flavors come through beautifully and the bread as a whole is just slightly sweet. It is not soggy at all, even after being soaked in a honey syrup. Instead, the bread is tender and has a subtle buttery taste to it. I wouldn’t put anything on it personally, but you could probably sneak a smidge of butter or a drizzle of honey onto each slice before eating if you wanted to. It goes perfectly with a cup of coffee and could be served at breakfast, during tea or as dessert. An additional bonus is the fact that the swirl in the center of the loaf is beautiful, and well worth the extra step of rolling out the dough. If you want to add a twist to this, you could add some rum to the honey sauce before drizzling it over the loaf. I’ll say this again at the end of the recipe, but I think that this is a loaf best served warm, so either eat it while it’s nice and fresh or pop it in the microwave (or toaster over) for a bit to heat up each slice before you dig in. Preheat oven to 350F. Lightly grease a 8×4-inch baking pan. In a food processor*, combine almonds, walnuts/pecans, sugar, cinnamon and cardamom, pulsing until nuts are finely chopped. Transfer to a small bowl and set aside. Clean food processor bowl and dry well. Add in flour, baking powder and salt. Pulse to combine. Add butter and pulse until mixture resembles very coarse sand. Add in milk and stir until dough comes together and is sticky, but not overly wet. You may not need to add the full amount. Turn dough out onto a large sheet of parchment/wax paper and knead into a smooth rectangle. Place another sheet of parchment/wax paper on top and roll out to an 8×14-inch rectangle. Brush with beaten egg and sprinkle with nut mixture, reserving 1-2 tbsp as topping. 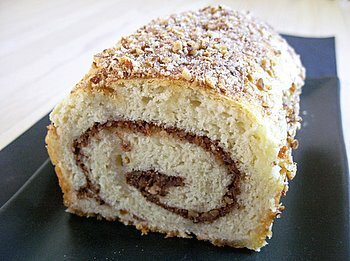 Starting with a small side, roll up jelly-roll style into a large log. Place in baking pan and brush with remaining egg. Bake for 50-55 minutes, until loaf is a light golden brown and a tester inserted into the bread comes out clean. Befor loaf is finished baking, prepare honey syrup. Place all ingredients into a small saucepan over medium-high heat. Cook for 5 minutes, stirring until sugar dissolves. Bring to the boil. Boil for 5 minutes. When loaf is done, remove from oven and poke several holes in the top with a large skewer (the smaller your skewer, the more holes you will probably need). Pour 1/2 the amount of hot syrup evenly over the loaf. When it has been absorbed (2-3 minutes), pour remaining syrup over it and sprinkle with reserved nut mixture. Let stand for 10 minutes, then turn loaf out onto a wire rack to cool slightly before slicing. Serve warm, preferably with coffee or tea. *Note: If you don’t have a food processor, you can rub the butter into the flour mixture with your fingers, as you might do if you were making a pie crust. Try using a rolling pin to finely chop – by which I mean crush – the nuts. If I do not have a food processor, what other methods can I use to get the dough? If you don’t have a food processor, you can rub the butter into the flour mixture with your fingers, as you might do if you were making a pie crust. Try using a rolling pin to finely chop – by which I mean crush – the nuts. And yes, you can definitely try this with other fillings, although I would pick something that would complement the honey syrup, which is delicious. ohh! kinda like cinnamon rolls? looks great. one question though, is the dough sticky/hard to work with? or is it easy? It’s very easy to work with. Oh, Nic…that looks delicous! And Matt’s a huge fan of baklava…I’m definitely going to (add it to the ever-growing list of things) to make that for him. And just a note: 60 BBM sign-ups, with 5 packages already in the mail! Looking to be a pretty good round. This is great! The flavours of baklava in a format that I can actually make! I will definitely have to try this one out. I will be at my Grandma’s for Easter and I need to call and find out what the plans are for brunch-maybe I’ll bring this recipe along.